Occasionally, as a result of injury or disease, something can happen to the brain that is immediately life threatening. It's possible that, at some point, you will witness someone having a stroke or a seizure. Recognizing the signs and calling 911 (999 in the UK, or the emergency number for your country) can be the difference between life and death. It's not always obvious, and it's normal to be frightened and unsure of what to do. So here at The Brain Geek, I'm going to teach you how to recognize the signs of a life-threatening neurological problem, so that you can call the paramedics. I'm also going to tell you some basic first aid that you can use in the few minutes before the paramedics arrive. These instructions are simple, easy to follow, and require no special training. If you're not sure what to do, remember this: Paramedics would always rather be called and not needed, than needed and not called. If you follow these steps and call the paramedics, you could save a life. Excluding mechanical injury like a car crash, a stroke is arguably the most immediately life threatening thing that can happen to the brain. In a stroke, minutes matter. What happens in the first hour can determine not only whether someone survives, but their quality of life after the stroke. But it’s not always easy to recognize. Familiarize yourself with the signs now, so you know what to do if you ever witness a stroke. Strokes happen when blood flow in the brain is disrupted. There are two types. 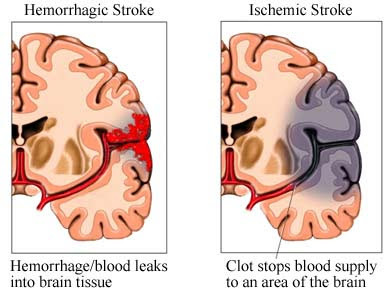 Ischemic strokes happen when a blood clot blocks a blood vessel. The neurons can’t get oxygen, and they die. Hemorrhagic stroke happens when a blood vessel bursts and blood flows into the brain. This also kills neurons. Strokes are immediately life threatening, and must be dealt with right away. Just because someone isn’t on this list, don’t assume they can’t have a stroke. If you see the signs, assume the worst, and call the paramedics. Paralysis or weakness on one half of the face. Ask them to smile. If only one side of the face moves, they might be having a stroke. Paralysis or weakness on one half of the body. Ask them to lift both their arms. If they can’t lift one arm very high, maybe it’s a stroke. Slurred speech. Ask them to say, “my dog has fleas,” and check to see if they slur, especially their s’s. Confusion. If a normally sharp person suddenly becomes confused and disoriented, they might be having a stroke. Remember, not all people having a stroke will show all of these signs. Sometimes, the paralysis/weakness will be on both halves, not just one half. IF IN DOUBT, CALL 911 (or the emergency number for your country)!! Call the paramedics. I really can’t stress that enough. Keep the person calm. Tell them you’ve called for help. People having strokes may have difficulty communicating. They’ll be scared. While waiting for the paramedics, the best thing you can do is keep them calm and let them know that help is coming. Tell the paramedics everything. They need this information, especially if the person passes out. Which side was paralyzed? What parts couldn’t they move? Even just this much info tells the paramedics where in the brain the stroke has happened. This may sound scary. It will be scary. But if you stay calm, recognize the signs, and call the emergency number, you can save a life. I LOVE what you're doing with this blog. You rock! Thank you for this article. I printed up for my parents. They are not kids (most days), but will benefit from this info as it not only is a easy reminder/guide, it also outlines very clearly for my mom that her actions during my dad's recent stroke were exactly right! Hi Linda. I'm glad the post was helpful. How is your dad? I hope that he is alright. Excluding mechanical injury like a car crash, a stroke is arguably the most immediately life threatening thing that can happen to the brain. In a stroke, minutes matter. What happens in the first hour can determine not only whether someone survives, but their quality of life after the stroke. But it’s not always easy to recognize.